Classic. Will let the star (my walnut butcher block countertops) shine. And even better, they come with built-in spacers on each side of the tile (called “lugs” by the pros). In case you’re wondering, I picked these up for just 21 cents per tile at one of my favorite flooring/tile suppliers, Floor and Decor. But more on that later. Since I want these guys to stick around for the long haul, I wanted to make sure I had a clear plan of execution & didn’t miss a step… which means getting the walls nice and smooth (the lugs provide a 1/16″ spacing, and I’ve read that because this tile has such a narrow grout line built in, it can be relatively unforgiving if the wall surface is uneven… so best to just do the job right and avoid problems later). You’ve already seen me remove the wallpaper around the kitchen (the parts that will have tile on them, at least). Ripping off the wallpaper caused a few gouges, so I needed to first repair those spots with some joint compound (similar to how I repaired the pantry wall). I also pried the bottom trim off of the window (it was original to the house & I want to re-install it on top of the tile… otherwise it will look like the tile is eating the bottom piece of molding). This is a Hyde drywall hand sanding kit. It comes with a 6ft long hose and two access points for pole and hose attachment (there are several brands available, but I’m a sucker for great reviews, and this one had them in spades). The genius is that it can attach to my new shop vac (a Christmas gift from Dad; like all of my tool gifts, I hugged it like it was a pony), which means that all of the messy drywall dust that I normally get covered in is sucked up into the vac instead. Nearly 100% dust-free, which means less cleanup later and healthier air to breathe after the fact. Tip: Normally, the standard shop vac is fine for most dust and debris, but for fine drywall dust, it’s best to use a HEPA filter that specifies it’s meant for drywall sanding and a collection bag that says the same. These will cost you another $15 bucks or so each at the hardware store, but it’s worth it not to have the dust blowing back out of the vac & floating around in the air. And what a quick job it made of the sanding step! As in, less than a half hour for the entire bottom half of the kitchen walls (from the bottom of the upper cabinets to the floor). The suction of the vac helped the sanding screen snugly slide along the wall (I highly recommend sanding screens even if you don’t use a sander like this one; they knock down any textures in drywall much faster than regular sandpaper & last much longer). For harder-to-reach areas around the sink, I used a low-grit sanding sponge. After the wall was smooth, it was time to seal the wall (a step my handy uncle recommended that I wouldn’t have thought about otherwise, but made more sense as I didn’t want to have anything re-wet the joint compound and cause any type of slippage once I applied the tile). A simple sealer-primer did the trick (I had plenty left over from cabinet painting). And then, I mapped out the tile placement again to double check my thoughts. Since the kitchen wraps around in an L shape, it seemed best to start the brick pattern in the corner (tiny slivers of tile would be very noticeable there). Nothing left to do now but take the leap & get it done. Cross your fingers that it’s all completed by next week’s update! Thanks for mentioning the sanding kit. I’ll be tiling a backsplash at our new house and that will definitely come in handy! Are you planning on painting the underside of your upper cabinets? Just curious. We did that in our last kitchen, and it really lightened up the under cabinet area, even before the under cabinet lights were installed. It did involve a number of odd painting angles to complete, so I also understand why you might not want to. Though if it brightened up your kitchen, even without it, I should probably get to that before I install the tile (that way I don’t accidentally paint the tile!). Great idea & perfect timing! Hi, I was wondering if you could please show exactly what you mean by the “lug” (ie, no spacers required) bits on your tile. I’m asking because I *thought* I had this on the tiles I used for our kitchen backsplash, but when I asked at the orange home store, the employees had NO idea what I was talking about. And so I used spacers, which adds to the work. I am thinking of doing the tile when we redo our bathroom, and would like to specifically pick out tiles that do not require spacers, but I don’t want to rely on the “expertise” of the store employees to tell me whether any tile has them. So….could you post a picture of the lugs, pretty please? Lugs are teeny tiny, so it’s hard to get a close-up shot, though I’ll definitely try to take more of those on the next post when I actually tile the wall (so that will be in next week’s update). A lot of times the big-box stores do not take the time to learn the “real” terms for certain features (and I get where you’re coming from on that, it’s SO frustrating to think they’ll have more info than you! ), and I think they are often just called “self-spacing” tiles. I suppose that’s so they can sell their products to the average consumer who wouldn’t know what “lugs” are either. I went to both orange and blue to look for tile, and NONE of the brands that I saw there have this feature… I picked up my tile at a specialty store, and they are the ones who pointed it out (I asked about spacers & they corrected me). The lugs are pretty easy to figure out if they are on your tiles (and my photo at the top, of all of the tiles lined up in a brick pattern, just baaaaarely shows them, but that’s the best I’ve got for now). If they are there, they are elongated bumps on each edge… they are small, but you can feel them with your thumb when you run your hand along the sides. In the photo showing my tile above, you can almost see where the nubs are causing the spacing along the dark grout line created by the change in the color of the line (it’s dark and then lightens and then darkens again where there is no lug). thanks so much for your reply! i think i can see them in the pics. Kitchen is looking great! It’s amazing what a little hard work, elbow grease, some blood, a few swear words, alcohol and possibly even a temper tantrum will do! I usually experience all of those things when I do any remodel. Can’t wait to see the next installment. Okay, that sander kit is WAY cool!!! It attaches to the shop vac?! Genius! This is so helpful and well-timed, you have no idea. Thank you! In case you ever wonder why in the middle of a DIY project that you have to stop and take pictures – just, thank you! This is possibly a stupid question but here goes….how will you attach back that bottom piece of window molding over the tile? Glue? In DIY, there’s just no room for stupid questions, so there’s really no such thing. Some of this stuff just isn’t straightforward. I’m not planning on actually tiling all the way up to the bottom of the window ledge, just making sure that the tiles go under the molding & look like they are (so no wasted tiles under the ledge unless it’s necessary). So more than likely, I’ll use my nail gun to shoot a few nails through the molding, at an angle, upward & back into the bottom of the ledge (but not using nails long enough to protrude through the top). That will affix it back into place & won’t actually have me going through any of the tile. If things don’t go to plan, I’ll just affix it directly on top of the tile with some construction adhesive. Not ideal though, so I’ll try the nails first. Doing a backsplash in a kitchen of a manufactured home. The walls are vinyl wallpaper which can not be removed without removing the panels. Is there a way to prep this kind of wall without removing the panels? I also want to paint the kitchen, was wondering if you knew how to prep the same kind of walls for paint? If you can’t remove the wallpaper, your options are probably limited. I would guess that your best option is to prime things really well to give the tile something less slick to stick to. Or for painting, again either primer or a thin skim coat over the wallpaper and then primer. Definitely consult your local home improvement guys; they’ve probably been asked this before! Lots of luck! Awesome little device you used to keep the ultra-fine drywall dust down during sanding. I know from experience the ultra fine dust you speak of…that gets everywhere. 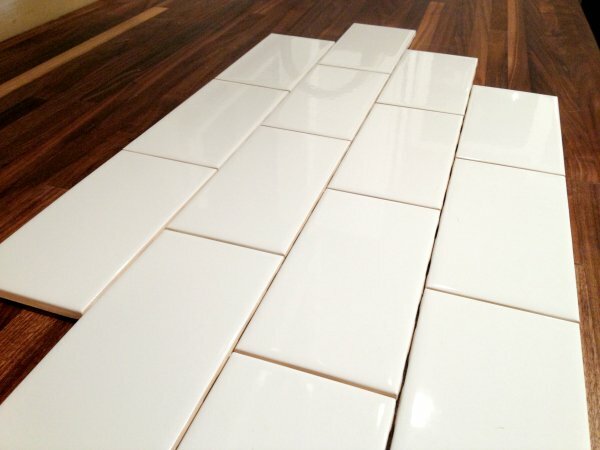 Can you tile over a light sand finish wall. I’m getting to different answers? what’s your opinion. My opinion is that people tile over previously finished walls all the time with success, but you need to make sure that you’re doing it right and using the right products. I didn’t face this issue, but if there is a paint sheen, you need to rough it up with some sandpaper (a “light” sand might not be enough… you need to make sure the area isn’t shiny anymore). There are also tile adhesives that are designed for use with painted drywall, so look for that kind of product description on the labeling. This would only be my recommendation, though, for dry areas like bathroom walls that aren’t in a shower/wet area, or the kitchen backsplash, or like I did in my laundry room. For a wet area like your shower, there are a few other steps you need to do for waterproofing (I haven’t personally done a shower tile project from start to finish, so I would recommend checking out DIYDiva.net or Young House Love blogs, who both did their own shower projects). Good luck! I am redoing my kitchen. I have removed the wallpaper, but before I put up wallpaper I put up the “lining” over paneling to make the walls smooth. That stuff is so stuck I could never get it down. Can you put up tile over that pape ling and is so how? Thank you for this info! I have painted textured walls that I want to do a kitchen backsplash over. I’m a rookie DIYer. I am not sure whether my paint is glossy, which I’ve read can cause problems with the tile adhesive. So I figured I would sand it since I have the texture anyway. I thought I would try just sanding it with my orbit sander and made it about two feet with already a big mess. So I’m now a believer in the need for your sanding kit. I don’t have a shop vac though. I don’t know if I would ever use it for anything else though, so I might be buying one just for this. Can you recommend a type or brand or what to look out for? And which one do you have? Thanks again! Do I have to sand centiiain light sand plus 90 with an adhesive to retine and do I have to prepare the painted area. I had epoxy put on countertops and backsplash. The backsplash rippled and I am very unhappy with it. Do you know how to correct? That’s a totally different process from tile, so I’m afraid I don’t have any experience with putting epoxy on a backsplash. Good luck in finding your solution though!